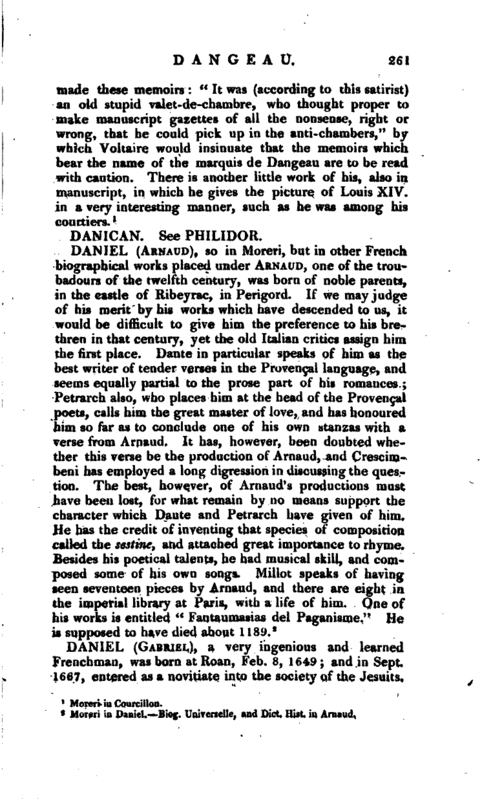 , a very ingenious and learned Frenchman, was born at Roan, Feb. 8, 1649; and in Sept. 1667, entered as a novitiate into the society of the Jesuits, | He read lectures upon polite literature, upon philosophy, and theology, at several places in the early part of his life by the desire of his superiors, after which he appears to have devoted his time to his historical and controversial works. 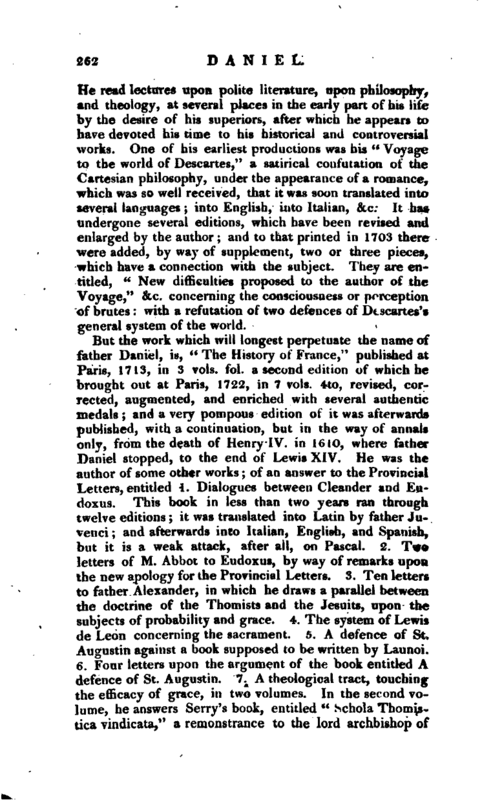 One of his earliest productions was his “Voyage to the world of Descartes,” a satirical confutation of the Cartesian philosophy, under the appearance of a romance, which was so well received, that it was soon translated into several languages into English, into Italian, &c. It has undergone several editions, which have been revised and enlarged by the author; and to that printed in 1703 there were added, by way of supplement, two or three pieces, which have a connection with the subject. They are entitled, “New difficulties proposed to the author of the Voyage,” &c. concerning the consciousness or perception of brutes: with a refutation of two defences of Descartes’s general system of the world. But the work which will longest perpetuate the name of father Daniel, is, “The History of France,” published at Paris, 1713, in 3 vols. fol. a second edition of which he brought out at Paris, 1722, in 7 vols. 4to, revised, corrected, augmented, and enriched with several authentic medals; and a very pompous edition of it was afterwards published, with a continuation, but in the way of annals only, from the death of Henry IV. in 1610, where father Daniel stopped, to the end of Lewis XIV. He was the author of some other works; of an answer to the Provincial Letters, entitled 1. Dialogues between Cleander and Eudoxus. This book in less than two years ran through twelve editions; it was translated into Latin by father Juvenci; and afterwards into Italian, English, and Spanish, but it is a weak attack, after all, on Pascal. 2. Two letters of M. Abbot to Eudoxus, by way of remarks upon the new apology for the Provincial Letters. 3. Ten letters to father Alexander, in which he draws a parallel between the doctrine of the Thomists and the Jesuits, upon the subjects of probability and grace. 4. The system of Lewis de Leon concerning the sacrament. 5. A defence of St. Augustin against a book supposed to be written by Launoi. 6. Four letters upon the argument of the book entitled A defence of St. Augustin. 7. A theological tract, touching the efficacy of grace, in two volumes. In the second volume, he answers Serry’s book, entitled “Schola Thomistica vindicata,” a remonstrance to the lord archbishop of | Rheinia, occasioned by his order published July 15, 1G97. 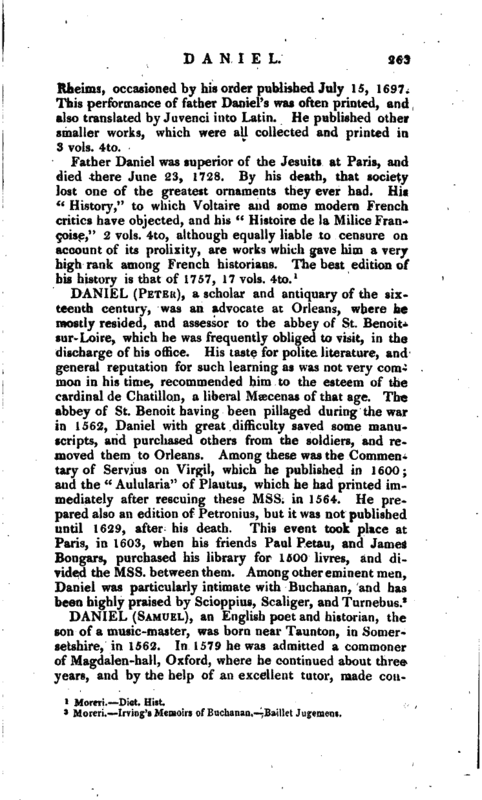 This performance of father Daniel’s was often printed, and also translated by Juvenci into Latin. He published other smaller works, which were all collected and printed in 3 vols. 4to.